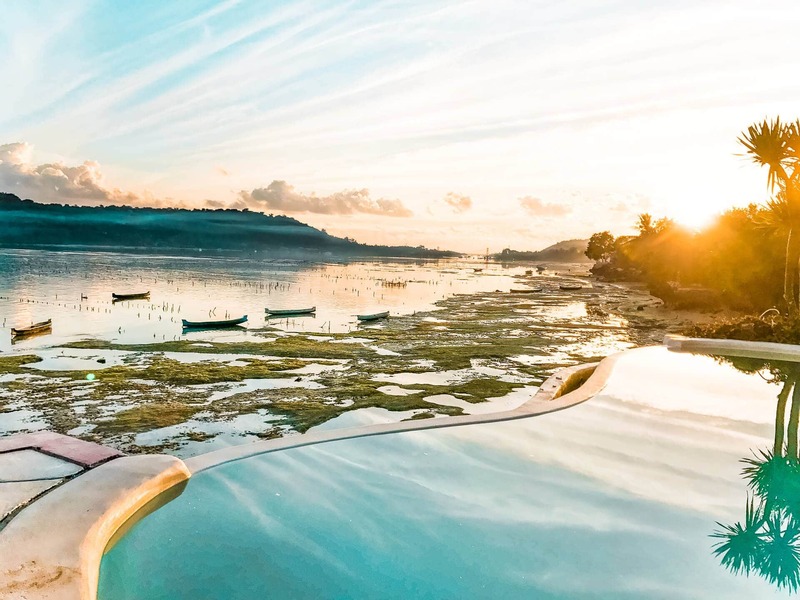 Nusa Lembongan is one of our highlights as a place to stay on in our 3-week Bali Itinerary. The island is just a 25-minute boat ride from Sanur, Bali. It’s a lot quieter compared to the Main island of Bali. Together with the near located islands Nusa Ceningan and Nusa Penida the Nusa Islands offers a full holiday outside of Bali mainland including white beaches, coastal cliffs drop, hiking and snorkeling with Manta Rays. Also, check out our 3-week Bali Route. 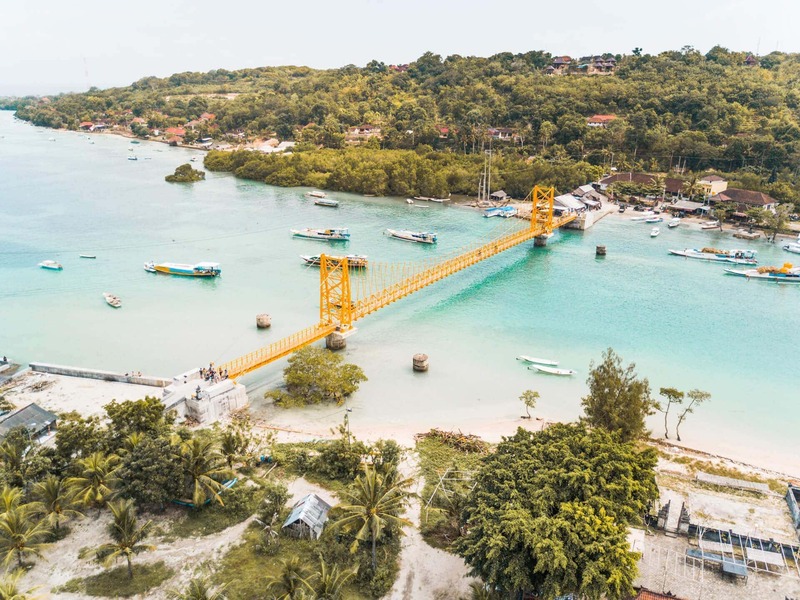 Nusa Ceningan and Lembongan are actually connected via the well-known yellow suspension bridge which is just wide enough to cross it with a motorbike. To explore both islands you will need a full day since it’s so small. We recommend staying 3 to 4 nights on the Nusa’s if you include a Nusa Penida day trip. Nusa Lembongan has some incredible spots shaped by nature. It’s best to explore the island via motorbike, which is for rent at $3 – $5 per day. 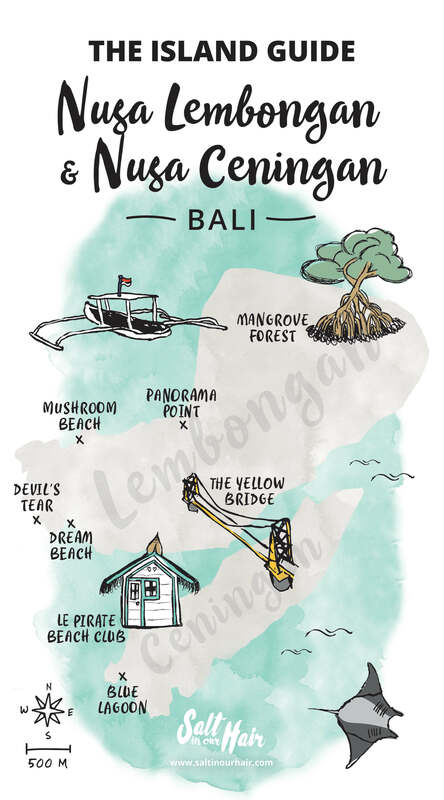 Drive through the Mangrove Forest and head over to Devil’s Tear, from there, it’s a 5 to 10-min drive to the Yellow suspension bridge to Nusa Ceningan where you have! to visit Blue Lagoon. And if you like to see more of the Mangrove Forest, then go Paddle Boarding through it! Nusa Penida is the island you will see in a movie. When visiting Bali, Nusa Penida should be your highlight. Located near all the bigger resorts but still a great beach to enjoy the sunset with a drink. Take a drink with you and sit down on the beach. Dream beach is located on the south coast of Nusa Lembongan island. There are a lot of rocks in the water so please be careful when swimming here. Our number one beach for sunbathing. Sandy Bay is a beach located near Devil’s tear. It is one of the best places to enjoy the sunset on Nusa Lembongan but it can get very busy. Nusa Lembongan and Penida are very well known for snorkeling with Manta Rays. As far as we know they are not fed and it all goes in a good way. From Nusa Penida you will take a 20-min boat ride to Manta Point, dive in the water and be amazed by these gentle giants. We talked about it before but the sunset on Nusa Penida is incredible. From Sandy Bay, it’s the best but most crowded. On Nusa Ceningan we stayed at Le Pirate where we had a perfect sunset and low tide. We lined up our favorite restaurants including a yummy(♥️) rating. Ok, let’s admit it. Swings are awesome. There are a few on the Nusa Islands. Sanur Harbor to Nusa Lembongan is only a 25-min boat ride. On Nusa Lembongan, you can get a driver to your stay. Easy as that! From Ubud, it’s a 2-hour drive to the coast and a 25-min boat ride. Boat schedules don’t really exist in Bali so be prepared for a lot of waiting! A 4 minute walk from the beach, located at Mushroom Bay. Wifi, Airconditioning and near the beach! 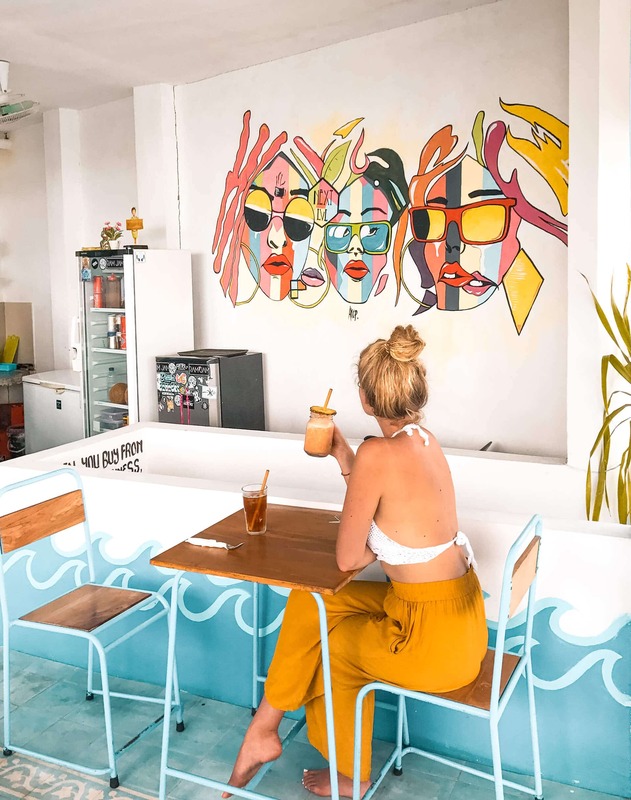 A beautiful place on Lembongan for just $15 a night! Your own cute little bungalow for just $15 a night.